“The car park has been re-marked and will have 111 regular bays with an increased size of 15’ x 8’. There are two disabled bays. Trees in the lot have been relocated and lighting has been improved,” the City said. “There will be CCTV cameras at both the entrance and exits of the car park. A total of four pay stations will be used in the lot and the system will still operate as a 2-ticket one. A move to a 1-ticket system is being explored for all barrier lots and will be implemented in the near future. The minimal bike parking at the south end of the lot will be removed for safety reasons. 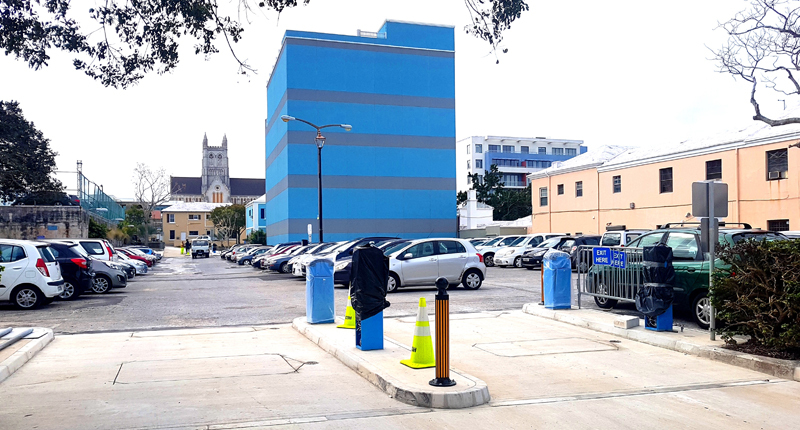 “Elliot Street Car Park will have its two-lane entrance on Elliot Street only. There will be no entrance from Dundonald Street. There will be three exit lanes – two onto Dundonald Street and one onto Elliot Street. “Pricing at Elliot Street will remain the same – $1 per hour with a maximum of $5 for all-day parking. As with the other barrier lots, if leaving Elliot Street car park within 10 minutes of entering, scan your entry ticket at the exit at no cost. “Pay stations or EasyPark Mobile must be used if time in the lot extends past 10 minutes. Payment is made at the end of your stay, not upon entry. Upon payment, motorists will have 15 minutes to leave the lot using their validated exit ticket. Those parking in the Elliot Street lot are encouraged to familiarize themselves with the upgrades, changes and signage posted in the lot. So CoH are widening sidewalks so people use their car parks. COH is just nasty. Repave the roads first then worry about widening up the sidewalks.